Legendary bay area thrash metal giants TESTAMENT released their 11th album, Brotherhood Of The Snake, this past Friday via Nuclear Blast. Today, they have released a music video for the brand new song "The Pale King". The hi-tech clip was directed, shot and edited by Tommy Jones (SLAYER, DEATH ANGEL, KATAKLYSM) for Videohammer Studios and you can check it out on KNAC.COM right HERE. "Secret societies, unknown other worlds, and superstitions mark this our 13th music video," comments guitarist Eric Peterson. "We wanted to do a band performance video with abstract ancient alien visuals, which we are set in. I think it's easily one of our best so far, and it was a lot of fun to make and work with Nuclear Bast recently newcomer Tommy Jones! Hails!" Brotherhood Of The Snake was recorded under the watchful eyes of producer Juan Urteaga (EXODUS, HEATHEN, MACHINE HEAD), guitarist Eric Peterson and singer Chuck Billy and was mixed and mastered by well-known metal producer Andy Sneap (ACCEPT, ARCH ENEMY, CRADLE OF FILTH, KREATOR, MACHINE HEAD, MEGADETH). Artwork was created by renowned artist Eliran Kantor, whom the band worked with for The Dark Roots Of Earth. Order the album today digitally via iTunes or Amazon. Various physical formats (Digibook, Limited Box Set, Limited Mailorder Box Set, Vinyl) are also available from Nuclear Blast (http://nblast.de/TestamentBOTSNB). 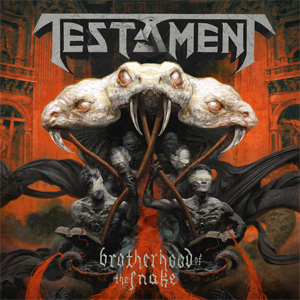 TESTAMENT are currently supporting Brotherhood Of The Snake on their European run with AMON AMARTH. The remaining dates are below.